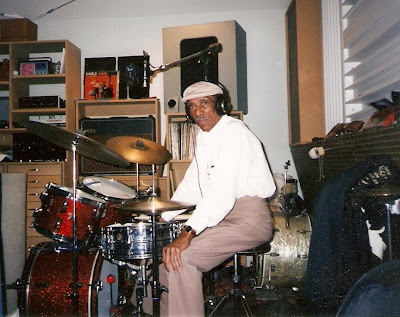 The great Earl Palmer passed away at his home on Friday after struggling with an illness for quite some time. Everybody knows Earl Palmer--even if you didn't know him by name. That's him drumming on Sam Cooke's "Twistin' the Night Away". He also kicked off Little Richard's "Keep A'Knockin'" which was later lifted by Led Zeppelin. He laid the ground work for the rock 'n' roll sound--first in New Orleans and later in Los Angeles. I had the pleasure of meeting Earl on a couple of occassions. Once at his weekly jazz gig in LA and again when Deke Dickerson hired him to play on his CD. Deke asked me to film some of the session so I got to sit right next to Earl in the studio while they were cutting the tracks. And--let me tell you--he was incredible. The rhythmic feel he had was amazing. I couldn't believe I was sitting five feet away from greatness. You will be missed, Earl.